Ever since we were little our dad has had a garden. When the squash and corn would be ready to be harvested my dad would always make calabcitas. His recipe included bacon and topped with cheese. I decided to make this traditional new mexican side dish healthier ,vegan, add a potato and have it for breakfast. Dice yellow onions, mince 3 garlic cloves, and diced potato. Sauté in cooking oil for approx. 8 minutes or until potato is soft. Add sliced mushrooms and green chile. Cook on medium heat and stir continuously. Last, add quarter diced zucchini and squash, salt, and the de-kerneled (is that a word?) corn. Cook and Stir until until the squash is al dente! 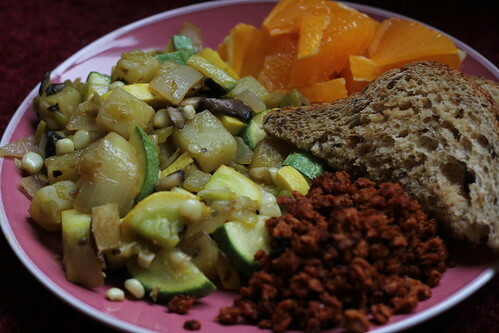 This entry was posted in Breakfast/Brunch, Recipes and tagged corn, green chile, mushrooms, potato, squash, zucchini on March 18, 2011 by kaylie.